one of my responsibilities has been finding ways to weave Postini's enterprise experience into Google's business offerings. Today, I'm excited to tell you about Google Apps Directory Sync, the latest improvement to Google Apps brought over from Google's Postini security and archiving services. Google Apps Directory Sync lets businesses and schools with an LDAP user directory system like Microsoft Active Directory or Lotus Domino transition more quickly and smoothly to Google Apps. Instead of manually maintaining a separate user account directory in Google Apps, this utility lets Google Apps tap into an existing repository of user account information. This new utility is a software component that helps maintain security by running behind the firewall and pushes directory information to Google Apps – including mailing lists, groups and user aliases – to match the organizational schema in the LDAP system. This is a one-way operation, designed so data on the LDAP server is not updated or altered. The utility offers many of the customization settings, tests and simulations originally developed and refined for the Postini directory sync tool to give complex organizations the controls they need to manage their directories effectively. Google Apps Directory Sync is now included at no additional cost with Google Apps Premier, Education and Partner Edition customers. As part of the team that joined Google when it acquired Postini in 2007, one of my responsibilities has been finding ways to weave Postini's enterprise experience into Google's business offerings. Today, I'm excited to tell you about Google Apps Directory Sync, the latest improvement to Google Apps brought over from Google's Postini security and archiving services. Exciting, useful sessions at Google I/O...be there! The Google I/O Developer Conference is coming up in just four weeks, on May 27 – 28, 2009 in San Francisco, California, so we thought now would be a good time to give you a sneak preview into some of the exciting Enterprise sessions we have planned. Traditional value-added resellers are looking for ways to adapt their business for the world of cloud computing and the new Google Apps Authorized Reseller program provides the perfect framework for moving a services business in this direction. This session will focus on revenue opportunities for partners in this area ranging from assisting with SaaS product selection, to guidance on best practices, to custom application development, deployment & integration work, and managed services. Learn how Google's reseller program can enable service providers to take advantage of these opportunities through marketing, sales and technical tools and resources. See Jeff's video invitation to his session here. The Google Search Appliance is an on-premise hardware and software solution that brings Google search into the enterprise, so users can find content quickly and securely. In this session, learn how partners today are plugging enterprise data sources into the GSA through Connectors and displaying results using OneBox. See Nitin's video invitation to his session here. With OpenSocial's proven global success in traditional social applications, the enterprise software community has begun to realize its potential and build innovative solutions that cater to the enterprise. Join us for a session centered on how the enterprise software development community is successfully bringing social concepts and technology into the enterprise. Key enterprise players will present and demonstrate how they've successfully used OpenSocial software to build new social solutions. One last thing to remember: even though Google I/O will be primarily geared around breakout sessions, there will be a ton of other interesting stuff going on, including the Developer Sandbox, Fireside Chats, Tech Talks and After Hours Playground. Click here to register. , an organization dedicated to supporting the enterprise data center industry. We share McKinsey's interest in helping the IT industry better understand cloud computing, so we'd like to join the conversation Appirio and others have started about the role of cloud computing for large enterprises. There's quite a bit of talk these days about corporations building a "private cloud" with concepts like virtualization, and there can be significant benefits to this approach. But those advantages are amplified greatly when customers use applications in the scalable datacenters provided by companies like Google, Amazon, Salesforce.com and soon, Microsoft. In this model, customers can leverage hardware infrastructure, distributed software infrastructure, and applications that are built for the cloud, and let us run it for them. This offers them much lower cost applications, and removes the IT maintenance burden that can cripple many organizations today. It also allows customers to deliver innovation to their end users much more rapidly. We thought we'd provide some insight into what we mean when we say cloud computing, and how its advantages in cost and innovation continue to attract hundreds of thousands of companies of all sizes -- from 2nd Wind Exercise Equipment to Genentech. We created our cloud by building an optimized system from the ground up: starting with low-cost hardware, adding reliable software infrastructure that scales, offering innovative applications, and working every day to improve the whole system. While the McKinsey study only considered the hardware cost savings of the cloud, there is tremendous customer benefit in all of these areas. It starts with components. We serve tens of millions of users, so we've had to build infrastructure that scales and can run extremely efficiently to support that load. Consider three areas of data center design: server design, energy efficiency, and scale of operations. In the virtualization approach of private data centers, a company takes a server and subdivides it into many servers to increase efficiency. We do the opposite by taking a large set of low cost commodity systems and tying them together into one large supercomputer. We strip down our servers to the bare essentials, so that we're not paying for components that we don't need. For example, we produce servers without video graphics chips that aren't needed in this environment. Traditionally, companies have focused on using large, highly reliable hardware to run databases and large backend systems, but there is a significant cost impact to that strategy. For example, a 4 CPU quad-core system with 600 GB of high end SCSI storage and 16GB of memory is 8 times more expensive than a system 1/4 its size with less expensive SATA storage. This is because the price of the components increase exponentially as the hardware gets larger and more reliable. By building the reliability into the software, we're able to use a much lower cost hardware platform but still maintain the same reliability to customers. Beyond server design, we do everything possible to make our servers and data centers as efficient as possible from an energy and cooling perspective. Consider how we designed our data centers for energy efficiency. Power Usage Effectiveness (PUE) is an industry-standard metric for measuring the efficiency of a data center. We recently shared that the average PUE for our data centers is now better than the state-of-the-art 2011 data center PUE prediction by the EPA. In other words, we beat the EPA's best case estimates three years early, and we achieved this result without the use of exotic infrastructure solutions thought necessary in the EPA report. And we're doing that at every level of the stack: from server utilization to networking. Finally, we operate at scale, and that drives economies of scale. Just by managing thousands of servers together and making them homogeneous, we're able to cut down on our administrative costs dramatically and pool resources of many types. This benefits end users by enabling us to offer low prices. But, most importantly for our customers, we manage this entire infrastructure such that they don't have to. According to Gartner, a typical IT department spends 80% of their budget keeping the lights on, and this hampers their ability to drive change and growth in their business. The reality is that most businesses don't gain a competitive advantage from maintaining their own data centers. We take on that burden and make it our core business so that our customers don't have to. While most discussions of cloud computing and data center design take place at the hardware level, we offer a set of scalable services that customers would otherwise have to maintain themselves in a virtualization model. For example, if a company wanted to implement a typical three tier system in the cloud using virtualization, they would have to build, install, and maintain software to run the database, app server, and web server. This would require them to spend time and money to acquire the licenses, maintain system uptime, and implement patches. In contrast, with a service like Google App Engine, customers get access to the same scalable application server and database that Google uses for its own applications. This means customers don't have to worry about purchasing, installing, maintaining, and scaling their own databases and app servers. All a customer has to do is deploy code, and we take care of the rest. You only pay for what you need, and, with App Engine's free quota, you often don't pay anything at all. A great example of software infrastructure that scales is the recent online town hall meeting held by President Obama. The White House was able to instantly scale its database to support more than 100,000 questions and in excess of 3.5 million votes, without worrying about usage spikes that typically would be tough to manage. Because of the cloud, there was no need to provision extra servers to handle the increased demand or forecast demand ahead of time. Beyond the underlying hardware and software design, what attracts many customers to the cloud is application outsourcing. There is limited value to running an Exchange Server in a virtual machine in the cloud. That server was never designed for the cloud, so you don't get additional scale. You'd also need to continue to maintain and monitor the mail server yourself, so the labor savings are marginal. But with cloud-based applications like Gmail, we take care of all of the hassle for you. We keep the application up and running, and have designed it to scale easily. All of this provides an application that is roughly less than 1/3 the cost of a privately hosted mail system, has 100x the typical storage, and innovates much faster. While the cost advantages of cloud computing can be great, there's another advantage that in many ways is more important: the rapid pace of innovation. IT systems are typically slow to evolve. In the virtualization model, businesses still need to run packaged software and endure the associated burden. They only receive major feature enhancements every 2-3 years, and in the meantime they have to endure the monthly patch cycle and painful system-wide upgrades. In our model, we can deliver innovation quickly without IT admins needing to manage upgrades themselves. For example, with Google Apps, we delivered more than 60 new features over the last year with only optional admin intervention. Recently, McKinsey & Company published a study on cloud computing as part of a symposium for The Uptime Institute, an organization dedicated to supporting the enterprise data center industry. We share McKinsey's interest in helping the IT industry better understand cloud computing, so we'd like to join the conversation Appirio and others have started about the role of cloud computing for large enterprises. to announce new developer tools that we think businesses will find pretty interesting. Several companies participated in the event by sharing how these tools improve their products and services. PivotLink and Ping Identity were two participants, and both have recently had customers successfully deploy their solutions. DMA, a national food service distributor, chose PivotLink's Software-as-a-Service business intelligence solution to give their employees greater visibility into supply chain information. DMA's users needed to visualize their data within Google Apps and iGoogle alongside other business information, news, and market data. To solve this, DMA is using the PivotLink gadget, which users can embed in applications like Google Sites to access PivotLink's reporting and analytics tools. SURFNet, the group that runs the national research and educational network for The Netherlands, chose to replace their proprietary Single Sign On (SSO) solution with PingFederate, Ping Identity's standards-based SSO product. SURFNet chose PingFederate because it could integrate with a variety of internet SSO implementations, be deployed quickly, and let their users access Google Apps and other cloud-based applications with a single set of login credentials. Want to learn more about how a solutions provider can help your business? Visit the Solutions Marketplace to find additional products and services, or read more customer stories on the Marketplace customer success blog. Learn about the latest updates from the app developer community. Remember to check out the Google I/O Developer Conference on May 27 & 28, 2009 in San Francisco, California. Learn more. A few weeks ago we hosted one of our Google Campfire One events to announce new developer tools that we think businesses will find pretty interesting. Several companies participated in the event by sharing how these tools improve their products and services. PivotLink and Ping Identity were two participants, and both have recently had customers successfully deploy their solutions. challenging our customers to show us their Google Search Appliances and share a picture of where their yellow GSA boxes fit into their organizations. The prize? Tickets to the upcoming upcoming Google IO conference, to be held in San Francisco on May 27-28. We had some great entries – but when we saw this picture, from the Web Dev team at Atlanta'sWellStar Health System, we knew we had a winner. Before GSA: With five premier hospitals in the Northwest suburbs of Atlanta, 11,000 employees and the largest nonacademic Physicians Group in the State,WellStar Health System has become one of the biggest not-for-profit health care systems in the Southeast. As WellStar grew, it became increasingly difficult for folks to find our stuff. WellStar’s intranet houses a physician portal containing content from over 70 different clinical sites – along with unique portals for 60+ supporting enterprise departments – andeveryone's generic material permeated our content management systems (CMS ). Employee and patient volumes intensified, organically creating a nightmare of a file library, and it seemed that our system needed 20CCs of Findability Stat! The challenge was to efficiently serve everyone at once while minimizing the impact on our own busy environment. After GSA: Our previous intranet search limited employees to each of our internal .Net portals, meaning employees would have to be sifting through the right haystack to find a specific needle, which gave them a whopping 1.4% chance of starting in the right place. This all changed with the GSA. The GSA crawls from a central location and provides a single URL to hit when employees need fast results. Its active replacement of cached, dead-end links diminishes wasted search time, and the “Text Only” document display feature is an essential business asset for clinical employees without specific readers. After purchasing the GSA and performing a minimal setup, our team found that the appliance was pulling several hundred rabbits out of its hat every eight hours. It was finding the one-of-a-kind policy, form, safety, and class information details from long forgotten documents – all without requiring someone to organize the material. Thin-air content was rediscovered, removed, and replaced with current information, and incoming help calls starting with “Where do I find…” have been eliminated. We had a few other standouts. Here's one. Meet Chris with the State of Missouri in Jefferson City, Missouri. Before GSA: The State of Missouri is made up of 16 executive agencies and various other non-executive agencies, boards and commissions. Prior to the purchasing the GSA, the state was simply a collection of data silos that provided no unified search for our citizens or the companies who wanted to do business with us. The bottom line: it was difficult (at best) for tax-paying citizens or businesses to find the information that they needed on the various State of Missouri web sites. After GSA: After implementing the GSA as a centrally-managed device, we made search available to all of our executive agencies as well as to our other agencies, boards, and commissions. The GSA allowed us to index all the relevant information from across all of these entities and provide a unified search option to our citizens. The flexibility of the device also allowed each of the agencies to integrate the search onto their unique agency site and further refine the search capabilities they offered to their taxpaying customers. Not only have the search capabilities greatly increased, from the citizen’s perspective, the data silos are no longer there and results across each agency are much more relevant. From all of us at Google: thanks, WellStar and State of Missouri. In the next few weeks we will be releasing their full case studies and if you are interested in knowing how other customers are using their GSAs we have more success stories here. Thanks for your participation and don't forget to register for I/O. Congrats again to the winners! Back in February we announced a contest challenging our customers to show us their Google Search Appliances and share a picture of where their yellow GSA boxes fit into their organizations. The prize? Tickets to the upcoming upcoming Google IO conference, to be held in San Francisco on May 27-28. We had some great entries – but when we saw this picture, from the Web Dev team at Atlanta'sWellStar Health System, we knew we had a winner. on channel growth around cloud computing and the emerging business scenarios for trusted IT advisors are good examples of the growing momentum around the ecosystem of channel partners like consultants, resellers and developers pursuing new models for doing business in the cloud. We're excited to share details of what we're seeing and are we're pleased to offer two ways to learn more about the benefits of cloud computing. For solutions providers, developers, and resellers. Co-hosted by Google and salesforce.com, this live discussion is aimed at helping channel partners understand the business change that cloud computing drives, and how to build the services that help customers benefit from these changes. Participants can expect to gain a fuller understanding of what cloud computing is, how it transforms the way that organizations think about IT, and how to make the most of the opportunity "in the cloud" for business growth and development. For organizations thinking of moving to a cloud platform for business productivity. We're participating with Daston Corporation, a Google Apps Authorized Reseller, to showcase Google Apps, Google's enterprise-ready communication and collaboration tools. This live webinar will feature an overview of Google Apps, and how the expertise of resellers like Daston can help organizations make the transition from traditional platforms to IT in the cloud. Recent commentary on channel growth around cloud computing and the emerging business scenarios for trusted IT advisors are good examples of the growing momentum around the ecosystem of channel partners like consultants, resellers and developers pursuing new models for doing business in the cloud. We're excited to share details of what we're seeing and are we're pleased to offer two ways to learn more about the benefits of cloud computing. – allows admins to easily see where their fellow community members are located; also highlights further information with a "click" on the marker. "Share your perspective " – uses Google Moderator to let admins easily add their own comments to posted topics, or vote on comments added by others. We've set this up to feature four topics at a time, so there's always something to talk about. We want this forum to create a sense of connectedness and community among the people who work as admins for Google Apps – a place where they can learn from each other, share what they've learned, and create a dialog that can help all of us learn. We also want it to be a place where people considering Google Apps can come in and find out more about what it offers, so we made this an "open" environment, where people can easily invite colleagues who might want to know more. There's even a way to send an email right from the forum itself. The Google Apps team hopes that this community adds value for admins, and we hope you'll take a look today. Listening to Google Apps admins talk – with us and with each other – made it clear: as IT professionals, admins wanted a way to connect online somewhere in the Google environment. We heard a clear call for a gathering place, or community – a meeting point where admins could meet one another, identify each other by business type or geography, discuss topics unique to their roles, and share learning and best practices in a way that helped in their professional roles. 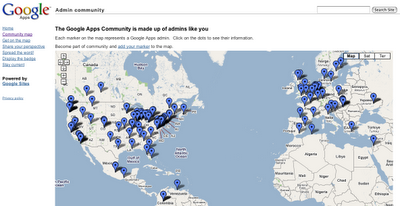 The Admin community map – allows admins to easily see where their fellow community members are located; also highlights further information with a "click" on the marker. to announce Cast Iron for Google Apps, a ready-to-go solution for connecting hundreds of on-premise and SaaS apps to Google Apps in just days. Want to learn more? Register for Cast Iron's upcoming webinar on integrating Google Apps with other enterprise solutions. Cloud computing is gaining momentum with organizations of all sizes. But many organizations work with a combination of cloud-based and on-premise applications. To leverage the many benefits of cloud computing, IT departments need to adapt to this hybrid world. That's where integration comes in. Whether building a recruiting app on Google App Engine or an enterprise gadget to create an analytics dashboard, IT has a fundamental need to exchange data with the rest of the enterprise. Cast Iron focuses on solving this problem of connecting SaaS and Cloud to on-premise apps. For Google Apps users, we are excited to offer Cast Iron for Google Apps, which provides out-of-the-box integration with Google Secure Data Connector (SDC) and pre-configured connectivity to hundreds of applications to simplify Google integration projects. SDC provides an encrypted connection between Google Apps and behind-the-firewall data, and Cast Iron provides connectivity as well as data transformation and process workflow capability. The net result is that Cast Iron for Google Apps is a one-stop tool to connect Google Apps with the rest of the enterprise. Join Cast Iron and Google for a joint webinar to learn more about Cast Iron for Google Apps and Google's recent developer announcements. You'll also hear from Doug Menefee, CIO of the Schumacher Group, who will explain how they used Google Apps, gadgets, and Cast Iron to create a portal for their 2,500 medical providers and doctors to access emergency room data in the browser anywhere, anytime. Want to see the latest from the app developer community? Don't forget to check out the I/O Developer Conference on May 27 & 28, 2009 in San Francisco, California. Learn more. Editor's Note: We're pleased to welcome Chandar Pattabhiram, Vice President of Cast Iron Systems, as a guest blogger. Cast Iron is a market leader in SaaS and cloud integration with thousands of customer integrations connecting cloud and on-premise applications. Cast Iron recently participated in our Campfire One event to announce Cast Iron for Google Apps, a ready-to-go solution for connecting hundreds of on-premise and SaaS apps to Google Apps in just days. Want to learn more? Register for Cast Iron's upcoming webinar on integrating Google Apps with other enterprise solutions. Googleplex (our Mountain View main campus), where we hosted 58 of the newest members in our Education Edition family. These customers represented 27 universities, community colleges, and K-12 schools from across the U.S. who recently moved over to Google Apps Education Edition. This Education Customer Summit provided these schools an opportunity to network with each other, hear from product specialists, and meet other customers who have been using Google Apps since the early days. We kept the participants busy all day with many lively sessions kicking off with a customer panel that included Columbus State University, Boise State University, and San Mateo Community College District providing insights into Google Apps successes on their respective campuses. Next, product managers and engineers led a discussion about products and features, answering a range of audience questions. This let everyone learn about some new features in detail, including improved contact sharing, the updated start page in Sites, and the new reporting in the control panel. We hope this day was as fun and valuable for the customers as it was for us, and enabled the school representatives to go back to campus with new contacts and ideas about how to make the most of Google Apps for their students, staff, and faculty. Check out the pictures below, and maybe we'll see you at the next Summit. Jeff Keltner, Google business development manager, kicks things off and welcomes new members of the Apps Education Edition family. Jeff and Tudd Sutton (University of North Carolina at Greensboro) field audience questions during the customer panel. Product engineers discussed Google Apps in depth and shared insight about what's in the works. A few weeks ago we held our first Google Apps Education Customer Summit here at the Googleplex (our Mountain View main campus), where we hosted 58 of the newest members in our Education Edition family. These customers represented 27 universities, community colleges, and K-12 schools from across the U.S. who recently moved over to Google Apps Education Edition. This Education Customer Summit provided these schools an opportunity to network with each other, hear from product specialists, and meet other customers who have been using Google Apps since the early days. Every once in a while, we invite members of the developer community to visit Mountain View campus to talk shop, share news, and eat Google'sS'mores. We call these events "Google Campfire One," and we held a lively one tonight. At tonight's Campfire One we announced some developer tools that we think will be pretty interesting to businesses: a new release of Google App Engine and the Google Secure Data Connector (SDC). Enterprise developers and IT professionals have been asking for tools like these to add custom applications to Google Apps and to connect Google Apps with their existing IT systems. App Engine already lets Google Apps customers build apps just for their users. The new features make it even easier to build and deploy business apps that integrate with Google Apps, and SDC gives enterprises a way to help connect their firewalled data to their Google Apps domain. Ten other companies, including Oracle™ and IBM™, participated in tonight's Campfire One to announce new apps and services incorporating these tools. Based on developer feedback, we've added several features to App Engine, including the ability to schedule tasks to run automatically (cron) and new database import/export tools to simplify moving gigabytes of data into/out of App Engine. We also announced an early look at App Engine's support for the Java language. We made this standards-based so Java developers can build apps with familiar APIs and move them to other application servers if the need arises. In fact, tonight's Campfire showcased IBM's demo of moving an app to IBM Websphere with just a few code changes (we're giving 10,000 interested developers an early look at our Java language support, so test it out and send feedback). We've also integrated App Engine with the Google Web Toolkit (GWT) and the Eclipse IDE so developers will be able write their apps from end-to-end in the Java language in a single IDE. During the Campfire, Appirio™, a Google Apps solution provider, showed how App Engine plus GWT and the Google Visualization API let them quickly write and deploy a complete recruiting management app without setting up servers or dealing with cross-browser compatibility. We also talked about giving developers who work on cloud-based business apps access to behind-the-firewall data – previously a difficult issue to tackle. To help solve this problem, we built the Google Secure Data Connector (SDC), a downloadable agent which lets IT admins connect Google Apps to resources behind the firewall. Today, you can use SDC with gadgets in Google Sites, App Engine applications, and spreadsheets in Google Docs. As part of tonight's event, Oracle showed how Oracle CRM gadgets will let their customers interact with sales and customer information from within Google Apps. Several other companies announced support for SDC in their products tonight. Cast Iron Systems has added built-in support for SDC to their integration appliance, allowing Google Apps to integrate with hundreds of different systems through a point-and-click interface. Panorama Software has added support for SDC to their gadgets, allowing you to visualize and analyze business data right in the browser. ThoughtWorks™, Cloud Sherpas™, Sword Group™, Ping Identity™, and PivotLink™ also participated in this Campfire One event. You can learn more about their announcements on our Campfire One participants page. You can visit Google Code to learn more about our developer tools, and if you're a developer, be sure to come to Google I/O in San Francisco, California, on May 27-28th. By the way, we shared the highlights of tonight's Campfire real-time on Twitter. Visit us there at http://twitter.com/googleatwork to see the current stream. All other company and product names may be trademarks of the companies with which they are associated. and for Google Calendar for the iPhone and for Android-powered devices. Click through the links to read descriptions on the Google Mobile Blog, and to watch a video overviewing the new features. To access these mobile apps, browse to http://www.google.com/m/a/example.com on your iPhone or Android-powered device (you'll need to replace "example.com" with your organization's domain name.) Continue by clicking the link for either Gmail or Calendar. It's important for business users to have fast, easy access to their email and calendars when they're on the go – even when cell phone reception is limited. That's why we're happy to tell you about new speed and functionality improvements for Gmail and for Google Calendar for the iPhone and for Android-powered devices. Click through the links to read descriptions on the Google Mobile Blog, and to watch a video overviewing the new features. virus got us talking with Scott Petry, founder of Postini (original developers of Google's suite of security and archiving services), and Wolfgang Kadek, CTO of Qualys. Their comments follow. To learn more about trends in spam, hacking, and ways of keeping email networks safe, join Google and Qualys in an on-line conversation, "In Cloud We Trust," on April 16, where we'll discuss these topics live. Q: Ten years ago, packaged software was the norm. Yet Postini built a hosted service - what we today call cloud computing. Why did you drive a cloud architecture for Postini? Scott: We believed that by offering a service infrastructure we could prove a lower TCO than an on-premise alternative. With that service infrastructure aggregating data, we'd also have insight into a wider sample of data, thus providing a more effective solution. Q: How did the idea of having a "perimeter protection service" to protect email networks in the cloud first evolve? Is the right model for the future? Scott: Postini's innovation was to see SMTP as an integration API and DNS as a way to access traffic, thus putting us "upstream" of the customers' infrastructure, alleviating integration challenges and stopping problems before they reached the firewall. We saw this as better for a number of reasons. Email servers have a long shelf life, and customers typically add incrementally to their system, rather than get a complete replacement. This causes a management problem for IT, creating a heterogeneous environment into which they must layer in security and compliance services. We never saw ourselves as just an anti-spam company, so we built infrastructure that allowed a business rule to be configured as tightly as a content string for a single user. This design decision is inherently linked to the cloud. It allows us to deliver a better anti-spam solution, and also expand into content compliance areas. Q. Wolfgang, you've been keeping a tight watch on the latest vulnerabilities impacting networks worldwide via your Laws of Vulnerabilities research. What are some of the trends you're seeing in 2009? Wolfgang: Our research into vulnerability trends has shown that the industry overall did not improve significantly its ability to address security problems in a timely manner At the same time attackers have been getting faster and more sophisticated. Proactive security by maintaining systems updated with the latest patches is the cheapest of all security tools, nevertheless it has not grown in the way I would have hoped. The first three months of 2009 have been a great example. We've seen Conficker infect millions of machines. The simplest way of preventing the outbreak would have been to preventively apply a patch, if available, to stop the worm. But figuring out such patches takes time. In contrast to worms of the past which often gave us months to react, Conficker activated only two weeks after the official release of the patch, clearly showing that attackers have become faster in their timing. It's getting tougher for patches to keep up. Q: As network security budgets continue to tighten, how can "security as a service" be advantageous to users? Wolfgang: SaaS solutions have the advantage that they have minimal setup and are immediately usable. Companies can get their feet wet with a small pilot, show success, and then grow it at their own pace to address larger needs. Organizations of any size can take advantage of the functionality and the predictable steady cost of cloud solutions, while at the same time enjoying the usability brought through constant improvements. Scott: Agreed. As IT faces more pressure from a changing threat landscape and increased compliance mandates, the cloud model gives maximum leverage to IT – always important, but especially in this economic climate. Register here for "In Cloud we Trust"
Editor's Note: There's never dull moment in the world of online security. Threat patterns evolve in volume, sophistication, and the types of exploits and sources. News about the recent Conficker virus got us talking with Scott Petry, founder of Postini (original developers of Google's suite of security and archiving services), and Wolfgang Kadek, CTO of Qualys. Their comments follow. To learn more about trends in spam, hacking, and ways of keeping email networks safe, join Google and Qualys in an on-line conversation, "In Cloud We Trust," on April 16, where we'll discuss these topics live.